Good news first: Between October and December, 2013, Apple sold 81.8 million devices which include 51 million iPhones, 26 million iPads and 4.8 million Mac desktops and laptops. These are excellent sales figure, much better than the numbers last year, for the same period when it sold around 75 million devices. But this sales data didn’t bring many cheers in the Wall Street, as their share prices plummeted 8.2% to $505.59 by the end of the day. 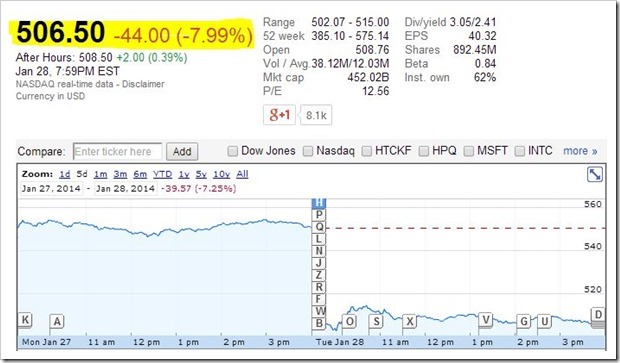 Apple has just announced it’s fiscal 2014 first quarter results which ended on December 28, 2013. The company has generated revenues of $57.6 billion and quarterly net profit of $13.1 billion, which makes around $14.50 increment on each diluted share. Gross margin has increased 37.9% compared to last year, for the same quarter. There can be several reasons which can be attributed to the drop in share prices and weaker than expected revenues for this quarter. a) Channel Inventory: Last year during the same quarter, Apple had finished it’s inventory and during the entire Christmas season, there was intense supply shortage. This news increased the market sentiments, and share prices increased. This year, except for some weak markets like India, there was ample supply of Apple devices, all through October to December. c) iPod sales are alarmingly dropping: This year, iPod sales were 52% less compared to last year. 12.5 million iPod were sold in last quarter, which dropped to 6 million this quarter. d) Less revenues as several crucial Apple software were given for free this quarter. We had earlier reported that although global mobile sales are increasing, Apple have been performing real badly for last few months. Although Apple’s unit volume increased by 12.9%, their market share fell by 3.4% as Samsung and other smart phone companies are increasing their foothold in the market. Apple is desperately trying to increase their market share in the smartphone and tablet market. They have partnered with world’s biggest wireless carrier: China Mobile to sell its iPhone smartphones in China. Keeping in mind the price sensitive Asian market, they have introduced the colorful and economical iPhone 5c series as well, the sale of which has not yet picked up and manufacturing is down. Some analysts are actually warning that the introduction of cheaper iPhones will dilute their brand positioning, and may even bring down the annual revenues and margins. Besides that, Apple has revolutionized iPad with the introduction of iPad Air and iPad Mini with Retina Display, the response of which has been positive as of now. Unless, Apple really comes up with something innovative and extra-ordinary (like they have in the past), seems like Apple’s best days are now behind them. Only time will tell whether they will be able to get back to their past peaks! Japan’s Terra Motors Enters India With 1000CC Kiwami Electric Super Bike!